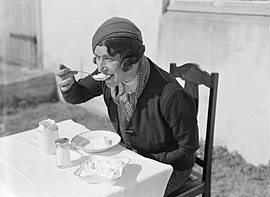 A German journalist enjoying a portion of skyr in 1934. Skyr[a] is an Icelandic cultured dairy product. It has the consistency of Greek yogurt, but a milder flavor. Skyr can be classified as a fresh sour milk cheese (similar to curd cheese eaten in Germany and Russia) but is consumed like a yogurt. It has been a part of Icelandic cuisine for centuries. Skyr has a slightly sour dairy flavor, with a hint of residual sweetness. It is traditionally served cold with milk and a topping of sugar. Commercial manufacturers of skyr have added flavors such as vanilla or fruit to increase the appeal of the product. Skyr is mentioned in a number of medieval Icelandic sources, including Egil's saga and Grettis saga. It is unclear how similar this was to modern-day skyr, as no detailed descriptions of skyr exist from this period. Culinary historian Hallgerður Gísladóttir has suggested that skyr was known throughout Scandinavia at the time of the settlement of Iceland, but eventually forgotten outside of Iceland. The word skyr is related to the English word shear (to cut), referring to how the dairy is split into the liquid whey and the thick skyr. Skyr is a high protein, low fat product made from low fat milk, varying slightly between brands. Unflavored skyr is roughly 13% protein, 4% carbohydrates, and 0.2% fat. Skyr is often mixed with milk and sugar. A traditional Icelandic dish exists which consists of roughly equal amounts of skyr and porridge. Skyr is often mixed with jam or fruit for a dessert, with prepared fish for dinner, or with cereals for breakfast. Contemporary uses include using skyr as a cheesecake topping and as an ingredient in milkshake or fruit smoothies. Skyr is made from skimmed milk which has been brought close to a boiling point and then cooled down to 37 °C (99 °F). A small portion of a previous batch of skyr is then added to the warm milk to introduce the right bacteria, and with the addition of rennet the milk starts to curdle. It is left to ferment for 5 hours before being cooled down to 18 °C (64 °F). After pasteurization the dairy is strained through fabric to remove the liquid whey. Bacteria such as Streptococcus thermophilus and Lactobacillus delbrueckii subsp. bulgaricus play an important role in the fermentation of skyr. Those also play a major role in the production of yogurt, but the yeast which are active in the low temperature step ensure that the dairy becomes a skyr and not a yogurt. Skyr is commonly consumed in Iceland and has a small share of the US yogurt market. ^ Guðmundur Guðmundsson. "Hnigfræði og smásæ bygging skyrs: Abstract" (in Icelandic and English). Archived from the original on 10 July 2012. Retrieved 25 April 2012. ^ a b "About the production of skyr" (in Icelandic). Mjólkursamsalan. 6 February 2005. ^ Kim Severson (14 September 2005). "Iceland woos America with lamb and skyr". New York Times. Retrieved 25 June 2018. ^ Hallgerður Gísladóttir (1999). Íslensk matarhefð (in Icelandic). Reykjavík: Mál og menning. p. 73. ISBN 978-9979-3-1846-0. ^ Magnússon, Ásgeir Blöndal (1989). Icelandic Etymological Dictionary. ^ "Nutritional values for KEA skyr hrært". www.ms.is (in Icelandic). Retrieved 26 February 2019. ^ a b c d e f Gunnarsson, Björn Sigurður (11 April 2003). "Hvernig er skyrgerillinn til kominn?". Vísindavefurinn (in Icelandic). Retrieved 26 February 2019. ^ "Icelandic skyr now makes up 2% of the US yogurt market". Icelandmag. Retrieved 26 February 2019. 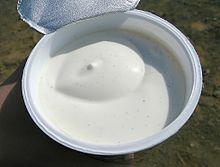 Wikimedia Commons has media related to Skyr.